You're not from these parts. In fact, you're not even from this world. You come from a place far away, a land called "Earth," in the year 2017 or so. You got sucked into a vortex, or your car got pulled into an earthquake, or you found a portal behind a Burger King, and before you knew it, you were in some kind of fantasy world. There's magic, and monsters, and all kinds of weirdness. But while you might not have a wizard's spellbook or a fighter's axe, you've got an edge all your own--you've read the books, you've watched the movies, you've played the games, and you know how these stories go. Plus, you've got some gear from back home that washed up with you. But will that be enough to get home? 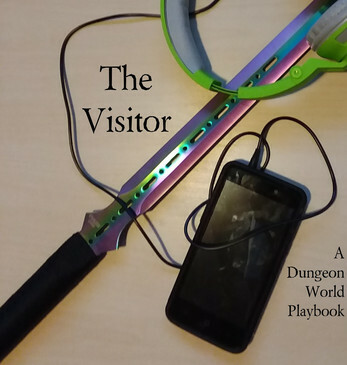 The Visitor is a Dungeon World playbook that allows players to become world-hopping heroes in the vein of Ash Williams, John Carter, or Arnie Niekamp from Hello From The Magic Tavern. You start play with a piece of "Earth Stuff" that landed in this new world with you--a gun, or a car, or a smartphone--that grants you a special ability. And as you advance, you'll make friends in this new world, carve out a niche for yourself, embrace your heroic destiny--or fade quietly into obscurity--and, hopefully, find your way home.